Your perspective on the best frequent flyer miles for Hawaii may depend on a few factors, such as the city you’re flying from (since nonstops are unquestionably more convenient), your preference for domestic first class/businessfirst or coach, and of course which frequent flyer miles you’ve already earned a lot of. Also, don’t ignore cheap fare sales to Hawaii. These can often be a much better deal than using miles to get to Hawaii, especially if you live near LAX or on the West Coast, although there have even been some notable fare sales from the East Coast area due to Hawaiian competing with United on its relatively new NYC-Honolulu nonstop. I recommend subscribing to The Flight Deal and also Travelzoo. But all that aside, here are my picks for the best value options. It’s hard to argue with a free one way, if it works with your international travel plans. It used to be possible to take advantage of this with American AAdvantage miles with an AAdvantage stopover, but that ended with No More AA Free One Ways. With United Free One Ways your one way to Hawaii isn’t free, since United’s award chart separates Hawaii from the continental U.S., but it can still be a good deal, especially on a business class award. A true free one way is possible if booking a roundtrip to Asia or Australia from the U.S. or Canada with United miles. Note that if you book a roundtrip to Hawaii using United miles, you could have a free one way to somewhere else in the mainland U.S. or Canada. For example, you could do SFO-HNL-SFO with SFO-NYC at a later date all for 40,000 United miles in economy. It will depend on whether you’re using American AAdvantage or United MileagePlus miles–check out our Best Travel Rewards Credit Cards for a prioritized list that includes both Citi AAdvantage and United and Chase Ultimate Rewards cards. You could take $400 off your Hawaii ticket with your 40,000 bonus from the Barclays Arrival Card, , and there’s no annual fee for the first year. If you happen to be flying during an off peak time from some of the West Coast cities, such as Oakland, or taking advantage of a fare sale, you could be looking at a nearly free or very cheap ticket. 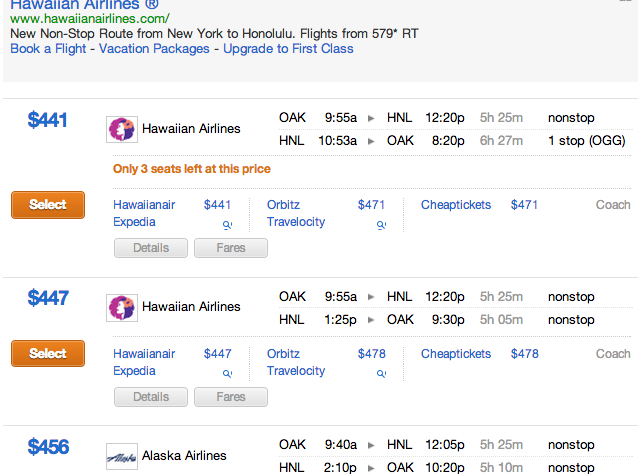 The $400 travel rebate would bring the cheapest OAK-HNL roundtrip economy fare above on Hawaiian down to $41. If you and your spouse and travel partner each get the card, that’s a total of $800 off your tickets to Hawaii, and you can fly your choice of airline while earning miles for the flights. Not bad! While United charges 80K MileagePlus miles for a roundtrip BusinessFirst award to Hawaii and American charges 75K AAdvantage miles for roundtrip Business Class to Hawaii from the continental U.S., you could use just 60,000 Singapore KrisFlyer miles to fly United BusinessFirst to Hawaii. The only catch is that you’ll need to call the KrisFlyer service center to book, it’s not available online. One of the best ways to earn Singapore KrisFlyer miles even if you don’t fly paid flights on Singapore Airlines is to transfer either AMEX Membership Rewards points or Starwood Preferred Guest points to Singapore KrisFlyer. While SPG points do transfer with a 25% bonus when transferring in increments of 20K points (20,000 SPG points transfer to 25,000 KrisFlyer miles) my strong preference is for AMEX Membership Rewards points because they transfer much faster–typically within 24 hours. SPG point transfers can take a week or longer, by which time the award space is gone. If you don’t mind flying economy and having a stopover in Seattle when flying from the East Coast, then the companion certificate is a good deal–plus, you’ll earn miles on the companion ticket, as well as the fully paid ticket, which isn’t a bad thing. As with the Alaska Airlines companion ticket, this offer is only for economy class, but is a good benefit if you’re on the West coast and normally fly coach to Hawaii with your spouse or a travel partner. If you apply for the Hawaiian Airlines World Elite MasterCard with 35,000 Bonus Miles you’ll receive a one-time 50% off companion discount for roundtrip coach travel. You must be one of the two people traveling, book the tickets with your Hawaiian Airlines MasterCard, complete travel within 13 months of being issued the credit card, and be traveling between North America and Hawaii (neighbor island flights are excluded). It’s 5-6 hours from the West Coast to Hawaii, so if you can survive a cross country flight in coach, 25K Avios roundtrip to Hawaii in economy is a great deal. Note that Alaska awards can’t be booked on ba.com, so you will need to call in, and unfortunately British Airways has pretty much stopped waiving the $25 phone booking fee, even when the award can’t be booked on the British Airways Web site. You could apply for the British Airways Visa, which has a current 50,000 Avios signup bonus after $1000 spend within the first 90 days . In past years there’s been a 100,000 bonus offer for the card, but the spending requirement has increased, so it may or may not be worth it to you to wait for the higher bonus offer. Alternatively, be on the lookout for another AMEX Membership Rewards to British Airways Avios Transfer Bonus. You can fly from anywhere Hawaiian serves in the U.S. to Hawaii for 35,000 miles roundtrip (which you get as the bonus from the Hawaiian Airlines World Elite MasterCard) if you’re a Hawaiian Airlines credit card holder. If you don’t mind flying coach on the long ~11 hour flight from the East Coast, 35,000 miles for coach roundtrip is a good deal if you don’t live on the West Coast. As I mentioned above in 3., the AMEX cards linked to Membership Rewards are my preference, since the points transfer quickly to Singapore KrisFlyer. But with the SPG AMEX you do receive the 25% transfer bonus when transerring in increments of 20K points. If you’ve gotten the 50,000 Bonus Miles Lufthansa Premier Miles & More MasterCard but can’t stomach the fuel surcharges charged on Lufthansa, Swiss and a number of other international partner flights, consider using 40K miles for roundtrip to Hawaii, without any fuel surcharges. Personally I probably would deal with the fuel surcharges and top up the bonus to get a one way first class on Lufthansa or Swiss, but I know many folks are very fuel surcharge averse, so a domestic flight to Hawaii could be a better use. Note that there is a $79 annual fee that is not waived. The 50K bonus miles offer for this card may expire June 30, so if you want it, best to apply now. What are your favorite frequent flyer miles for getting to Hawaii? nevertheless, these call for a connect-in set up).